This isn’t some kind of imitation meat. This is real, all natural meat. It’s not minced or mushy or “spammy.” Each can is full of large, tasty chunks. You can get canned beef, hamburger, chicken, turkey, pork or bacon. I’ve had them all and they taste a lot better than I thought they would. They’re great, in fact, and they last at least 5 years (though I’ll bet you they would make it 10 to 20 years). One of my favorite things is to stir fry the beef and mix it with some spaghetti sauce, but it tastes great lots of different ways. 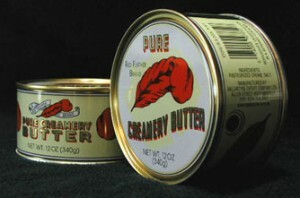 I never knew there was such a thing as canned butter until I found Internet Grocer. This is some of the smoothest, creamiest butter I’ve ever eaten. Finding this was a big deal for me because so many of my storage food recipes require butter, and I knew that would be a problem if the power went out and my fridge stopped running. So to sum up, I think if you want to have a healthy, well-rounded food supply, you should definitely look into some canned meat, cheese and butter. They have a lot of other foods I haven’t tried yet. If you’re interested, visit Internet-Grocer.com.